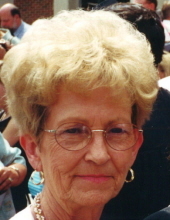 Alice Smith Mattingly, 87, of Paducah, passed away on Tuesday, February 5, 2019 at Ray & Kay Eckstein Hospice Care Center. She was born on August 5, 1931 in Iuka, Kentucky to the late John K. Smith and Clara Ann Wolfe Smith. Alice had a passion for crocheting which in turn allowed her to bless many children by donating over 550 crocheted scarves to local schools. She retired after 38 years of service as a bookkeeper at Pip Johnson Construction of Calvert City. She grew up attending the Iuka Baptist Church. She is survived by one daughter, Sherry Anderson and husband, Jerry, of Paducah; one granddaughter, Heather Chipps Traylor and husband, Mark of Nashville, TN. ; two great-grandchildren, Hibbs Traylor and Smith Traylor. She was preceded in death by three sisters, Helen Champion, Juanita Harp, Margaret Jones; two brothers, Ralph Smith, Charley Smith; two infant siblings and her parents. A graveside service will be held on Friday, February 8, 2019 at 11:00 a.m. at Iuka Cemetery with Rev. Mike Rothwell officiating. Milner & Orr Funeral Home of Paducah is in charge of arrangements. Expressions of sympathy may take the form of contributions to the Iuka Cemetery, 736 Jake Dukes Road, Grand Rivers, KY 42045. To send flowers or a remembrance gift to the family of Alice Smith Mattingly, please visit our Tribute Store. "Email Address" would like to share the life celebration of Alice Smith Mattingly. Click on the "link" to go to share a favorite memory or leave a condolence message for the family.